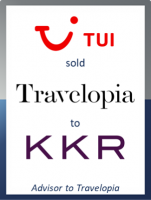 Will Waggott, CEO of Travelopia, said: "KKR's experience in the sector, global reach and digital expertise make it the perfect partner for Travelopia as we continue to grow. The team at GCA Altium were excellent, providing us with first class support and guidance through the sale process. Their travel sector expertise and extensive transaction experience were invaluable and enabled the management team to secure an excellent outcome." Christopher Jones, Managing Director at GCA Altium, added: "It has been a pleasure to advise Will and the Travelopia team on this landmark transaction. Travelopia is one of the largest specialist travel companies in the world with a leading position in the growing activity/experiential travel niche. In KKR, management have found a partner that shares their ambition for the business and we have little doubt that the business will continue to thrive under their ownership."